This older horse is not starved, but could use more weight. 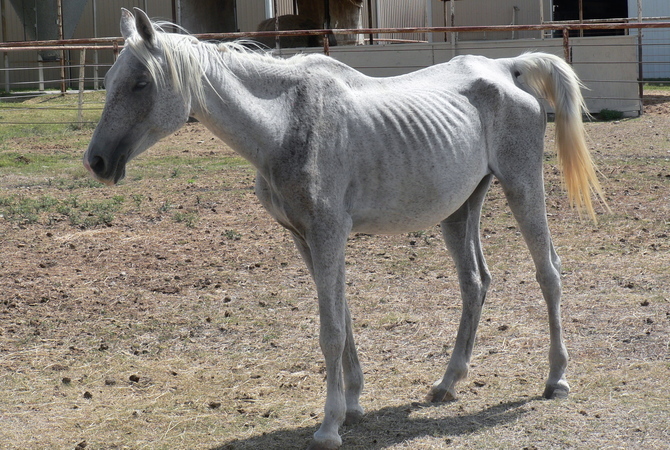 Severely starved horses may take up to 10 months to recover. Few sights are worse than the tragedy of malnourished or starved horses. It is important to consider that not all underweight horses are the victims of abuse or neglect. Occasionally, horses may have or be recovering from serious conditions (cancer, inflammatory/infiltrative bowel disease, parasitism, colitis, surgery, etc.) that have led to weight loss, and their owners are doing all they can to help the horse regain its previous condition. When refeeding these horses, we must overcome our first impulse to immediately feed them whatever and however much they want. Months of neglect cannot be reversed in a few days or weeks. It takes an estimated 60-90 days of feed deprivation for a normal, healthy horse in optimal body condition to drop enough weight to lose its ability to stand. Starvation causes muscle weakness and hypothermia, and decreases gastrointestinal function, wound healing, and immunity. Horses that have been unable to stand for three or more days have a poor prognosis for recovery, even with aggressive treatment. Overfeeding malnourished horses can cause much harm and potentially death. Starved horses will have decreased gut bacteria and protozoa populations (flora) that are essential to ferment forages and other feeds. Additionally, the gut cells that produce digestive enzymes will have decreased ability to digest and absorb feed. For these reasons, refeeding must occur gradually to allow the gut flora and digestive ability to recover their normal functions and readapt to feed. Initially, starved horses should be fed at 50% or less of their current (poor body condition) needs. The horse then can be fed at its present (but low) body weight for another 2-3 days. Once the horse has adjusted to feed intake and its gastrointestinal tract has readjusted to eating, the amount of feed can be increased over 7-10 days to meet requirements for its ideal body weight. It is not unusual for some diarrhea to occur with refeeding. The diarrhea is usually fairly mild (the consistency of a cow pie) and resolves without any treatment. The best initial feed is usually good-quality hay. Horses can also be turned out on pasture for 2-3 hours, and grazing time can be increased as described above. Concentrate feeds (pellets and grain) should probably be avoided for the first 2-3 days. Nonstructural carbohydrates (highly digestible sugars) such as those found in concentrates should be less than 20% of the diet. Complete pelleted feeds that do not have a high grain content work well for concentrate feeding. Ideally, feedings are spaced out every 4-6 hours to better allow the gut to adapt to refeeding. The number of meals fed can be gradually reduced to 2-3 per day as the horse is able to eat more. Horses should have access to or be fed trace minerals. Some nutritionists also recommend supplementation of B vitamins because they are important for energy metabolism and many are produced by the gut bacteria. The transition back to normal body weight is gradual. Slow refeeding minimizes the chances of adverse gastrointestinal effects and laminitis (founder). Moderately starved and thin horses usually regain body weight within 60-90 days. However, severely starved horses may not recover fully for 6-10 months. If malnourished horses do not gain weight as expected, have them examined by your veterinarian to determine if any underlying disease or parasitism may be complicating or preventing recovery.